My buddy Rick recently hipped me to his blog, Past His Prime In NYC. Like me, Rick moved to Manhattan in his early twenties. And like me, Rick is married, and a dad. And like me, his blog often explores the discrepancy between what was and what is. I appreciate Rick’s point. And I agree — with one, crucial caveat. Maggie’s first movements — reaching for toys, rubbing her eyes, rolling over — were terse and jerky, as if her neurons were firing at near-random. 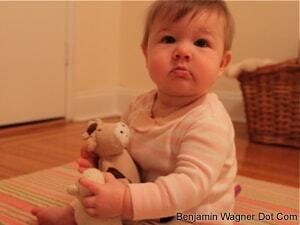 As she’s grown, though, her movements are increasingly fluid, concerted, deliberate. I’m sure there’s some science behind all of it, but I’m not interested in science; for me, it’s metaphor. My twenties and early-thirties were full of twitchy, rogue movement. It took practice, patterns and discernment, mistakes, insults and injuries, to gain even an iota of insight as to my direction. My stories, then, were equally florid. Sure, I was out carousing every night, filling rooms with melody and discord, kissing at random, and hailing cabs at dawn. It made for good “Diner” fare, compelling “You Won’t Believe This Story…” stories. But it was meaningless misdirection, all sound and fury signifying nothing. I don’t own a home. I don’t have a mortgage. (Though my back definitely aches.) Still, it seems to me that the most compelling component of any narrative is stakes. What matters? What are you fighting for? What’s to lose? There are no greater stakes than family. No late-night, strobe-lit, a-list party can compete. No beer-soaked, pot-fueled, laughter-filled Friday comes close. No rock show beats Maggie playing xylophone for a stuffed-animal audience. I miss those stories too, but I don’t need them anymore; they’re fiction. Thanks for sharing the blog, and your own insights on what becomes more important. At 34, I flail and thrash in life and in my blog in search of that “direction” that will sort of act as a compass for the rest of my life. No wife or child, a mortgage and a growing tiring of the night life, I feel in limbo at time.